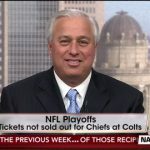 In a recent interview with the Associated Press, Ed Butowsky, managing partner at Chapwood Capital Investment Management LLC, discusses why he is concerned with the NFL Lockout in the news today. Ed manages money for high net worth individuals including many professional athletes. He is always concerned about bad investments and not compounding money the right way. Now without having a contract or on the playing field receiving paychecks, these NFL players with more than likely not reduce their expenses enough and money being spent that this will cause a “financial calamity” that these players will not recover from. This lockout in the NFL between the owners and the players could be disasterous for anyone playing in the NFL. If you take out the top 5% wage earners in the NFL the rest of the players are not in financial distress until about 5 years after they finish playing. This is primarily due to the fact that while they were playing their lifestyles were so big. In reality the amount of money they take home is significantly less than what you read about discussions around their contracts. What is the message to these players in the NFL? Ed could not be more straight forward than by saying “Cut Your Expenses” a million times. Players should do this across the board anyways, under normal circumstances, but this lockout just amplifies the need that much more. Its surprising to see players approach Ed and ask what they should do, and Ed replies that there is not much more they can do – they need to get back on the field and play. Its not as if the players could find another means of sustaining their lifestyle, and therefore as Ed points out that the players are at a disadvantage in this situation. The NFL lockout of 2011 has been coined the Billionaires VS Millionaires and in this case the billionaires are going to win. The billionaires in this matter can withstand the lockout, the average player (or millionaire) cannot. Especially with the size of many of these players expenses, their investments while they may be growing and compounding it cannot keep up with the expenses.